Having recently sold a few homes in Tallahassee’s first gated community, (Lafayette Oaks), I have plenty of updated information about this popular neighborhood in Northeast Tallahassee. Lafayette Oaks was selected as the 2012 Neighborhood of the Year for unincorporated Leon County by the Leon County Council of Neighborhood Associations (CONA), and is still very popular today. We see a lot of traffic on our property search tool from buyers who are looking to find a great deal in Lafayette Oaks. Currently, there are four houses for sale in Lafayette Oaks, priced from $227K to $355K. Lafayette Oaks is named for the great Marquis de Lafayette because its location is part of the 23,000 acre land grant that was gifted to General Lafayette for his service to the United States during the Revolutionary War. The following three real estate graphs use the same format. The number of homes sold each year are shown as blue bars and measured on the left vertical axis. A different piece of information will be shown in red and measured on the right vertical axis. 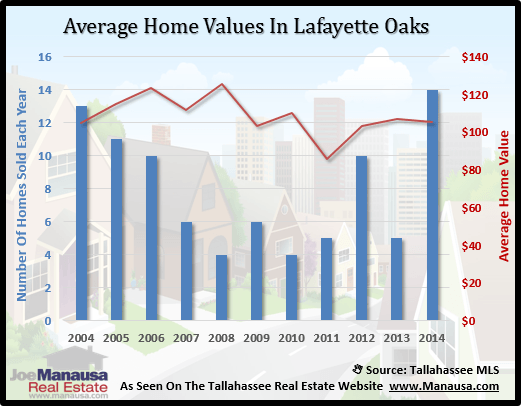 The graph above shows the average sales price for homes selling in Lafayette Oaks each year going back to 2004. This year, the average sales price of homes sold in Lafayette Oaks has been just over $272,000. The next graph shows that home values in Lafayette Oaks have been rebounding nicely since hitting the bottom in 2011. Appreciation has cooled this year as the average value has dropped to $105 per square foot, but the number of homes sold through August is greater than home sales through 12 months of all previous years. This means that Lafayette Oaks is hot and buyers are loving the values that they find there. 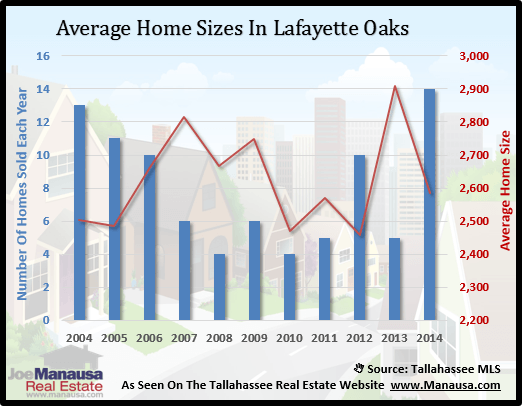 The average size of homes sold in Lafayette Oaks in 2014 is just under 2,600 square feet. With so few homes sold each year, this is a statistic that bounces around quite a bit. Averages have ranged from below 2,500 square feet to a high in 2013 over more than 2,900 square feet. The following list shows the most recent homes listed for sale in Lafeyette Oaks (updated twice daily). 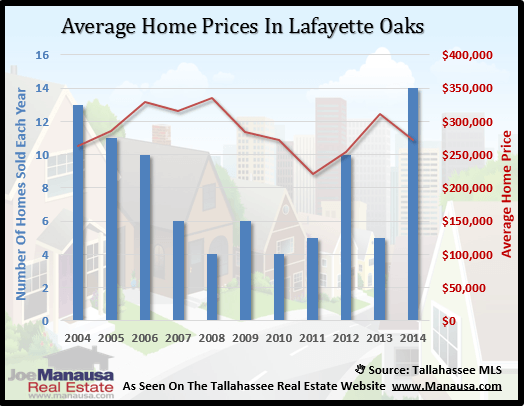 The following list shows all homes sold in Lafayette Oaks and recorded in the Tallahassee MLS from 2002 to present. I hope you enjoyed our August 2014 Lafayette Oaks Home Sales Report. If you would like to know more about buying or selling a home in Lafayette Oaks, just drop me a note and we will be in touch with you pronto!